Name Change: SMLT is now The Great Bike Powered Light Show Dance Party! Call for playlists now open! 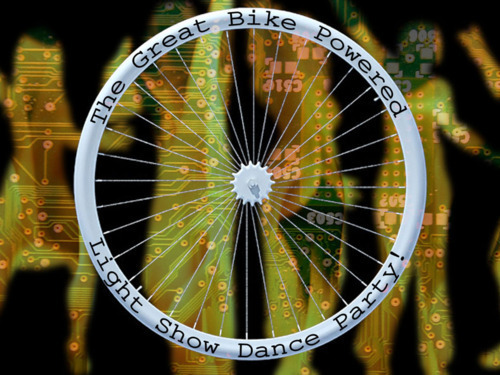 I am happy to announce that the call for audio mixes for my next work, The Great Bike Powered Light Show Dance Party! is now open. Mixes may be of any kind of music. Mixes can combine genres, tempos, popular, or original tunes. I only ask that they be a mix of several songs. The preferred length is one half hour. However longer mixes will be considered. B sides are also welcome. The Great Bike Powered Light Show Dance Party! Steers new technology away from alienation and towards real world, carbon free participation! Bikers crank power to a boombox and a projector. Music contributed by local musicians plays as digital imagery beams onto the very bodies of the dancer/participants. The visuals follow the shape and movement of the participants, paying attention to every gesture and transforming in reaction to movement and sound. The Great Bike Powered Light Show Dance Party! Electronic imagery absorbs the focus of our daily lives in an increasing and encompassing manner. We work in front of computer screens, recreate before ever larger TVs, and socialize over smart phones. Before long, reality will be overlaid with Google Glasses, and we will dream of electronic sheep. The time has come for digital images to pay attention to us: to our bodies, our movement, our dance! Conversely, technology has made our lives so easy that one of the largest health problems facing industrialized nations is obesity. We can order food on the Internet, Skype with friends and work remotely from our beds. It is time that we physically labor, that is we sweat, for our electricity! First through the technique of dynamic projection mapping to use our bodies as media screens, and second by providing power for all this through bicycle generated electricity, The Great Bike Powered Light Show Dance Party! addresses both of these concerns. The participants enter the space into darkness. There are two stationary bicycles in front. Two of the participants mount the bikes and start pedaling. Slightly visible towards the back is an eighties boombox. Also there are white balloons, streamers, and sheets for participants to wrap themselves in. Once everyone is inside, the artist announces the creator of the audio mix and starts the music. The light show is driven by an algorithm which takes into account the movements of the audience and the sounds from the tape. Light projects onto the walls of the space and the very bodies of the audience. At first they find that they are only partially lit. Some are headless, others only heads. The walls look like that of a prison. Audiences are free to do nothing and remain repressed, or through dance become participants and carve out their liberation. If they move in rhythm with the music the walls open up and more of themselves appear. As participants move together the imagery projected onto them becomes connected. Depending on the music, they may find themselves covered in clouds, lit on fire, or covered in wires with glowing pulses flowing from person to person. The walls become places real and abstract such as forests, space, the sky, or swirls of colored light. The algorithm draws imagery for bodies and walls from a virtual library of images, video, and effects assembled by the artist. Siri: I’ll make a call for you but can’t answer it. I just a bought an iPhone 4s for my father-in-law who recently became vision impaired. Siri was great at making calls for him. All he needs to do Is say “call” and a name in his contacts. She also does great with the weather. There seems to be a learning curve for everything else but hopefully we’ll learn more as time goes on. There’s just one thing missing. I say “Sirii can you answer the phone? When a phone call comes in, can you ask us to answer it or send it to voice mail?” She doesn’t understand, she can’t help us with that. There seems to be no way to answer the phone without the use of vision. When a all comes in the are two buttons on the screen one to recive the call the other to sen dto voicemail. I told him that he should just touch the screen anywhere, at least he had a 50% chance. He had an easier time with his flip phone because he could just open it when a call came in. After searching through the user guide and googling it a dozen times, I called apple support. They were nice, but kind of stumped. The guy put me on hold for six minutes to speak to his manager. He even said that He thought something was missing. The best solution they could come up with was to program in a custom gesture he could use to answer the phone. When you turn on Voice over, you can answer calls with a two finger double tap. ScreenThings Independence Project basic diagram. The diagram proposes taking ScreenThings to the next level as a solar powered autonomous life form. Adobe’s recent announcement to discontinue work on Flash Player for mobile strikes me as hugely ironic. I was with Flash from the beginning. Almost the beginning, Flash 4 to be exact. It was the late 90s. The web was young, broadband was 56K modem, most computers were slower than today’s phones. Video on the web was still sci fi. You’d have to wait hours to download minutes of video only to find out that you then needed to download a player. Then there was Flash! It was absolutely amazing. Flash was high res animation streaming right through your 28K dial-up. How could it be? The answer was vectors. Flash, at the beginning and through mid-life was vector-graphics timeline animation. As I often explained at the time, vectors were pictures made with equations, whereas the opposite, bitmaps, were pixel colors for every damn pixel in the picture. You might not get photographic detail with vectors, but you sure got more bang for your buck and as a bonus the pictures were scalable. You could zoom in without it getting blotchy. Web animators could get really smart with Flash too. It allowed you to make pictures into symbols, and reuse them with out increasing the file size or streaming bandwidth of the animation. Then Macromedia introduced interactivity in Flash 4 with the ability to write short lines of code into the timeline. At first it was stuff like “click this button and go to this other frame. ” You could also nest one timeline in another, so besides having a car animation with independently turning wheels, a smart Flash person could make games or complete websites. Notice how I said “Flash person,” I could have said animator or designer or developer, but none of those really fit for the stage Flash was in at he turn of the century. At the time, serious animators drew by hand or worked in after-effects, serious designers were still mostly in print, and developers were writing code. To do Flash required all 3 skills. That what was so great about it for me, personally. When I got into Flash, I was working as a graphic artist mostly PowerPoint presentations. I loved working with vectors in Illustrator, so I dove into Flash with excitement. At first I feared writing code, using the novice mode which was like selecting choices from a menu, so there was no chance of a typo. Soon I was making my living at it, being a designer and learning to code as the language of Flash, Action Script, developed. Flash reached it’s peak in 2004 when it launched a piece of software with the longest name ever, “Flash MX 2004 Professional Edition.” It was the first release to allow streaming video. At that point it was still largely timeline based, but developers had started moving away from that controlling things with code. Folks at Macromedia started touting RIA, or Rich Internet Applications, meaning Flashy apps that showed you data in a cool, fun way. A good developer could make a whole interactive , fun flashy website which displayed and submitted real data, like shop inventory and user’s credit cards. The world would be ours! And yet, there were still plenty of low bandwidth animations to be made. Flash was taking over but kept it’s soul. Then adobe bought Macromedia and ruined it all. It tried to turn Flash into a platform for the web. The soul of vector-based timeline animation withered under the weight of a platform tasked with the ability to do anything on any kind of system. I’ve had a lot of people introduce me as someone who does lighting. I find that strange, but I can’t totally disagree. From my perspective, my work is a combination of design, animation, interactive programming, projection mapping, installation, and live-mixing. However, the end product is usually made from light coming out of a projector. I’ve also been projecting directly onto people lately, so I can see how I’m getting a rep as a lighting guy. Ultimately, I view myself as an artist. The programming, animation, and whatever else are really just tools, like chisles or brushes. Each project necessitates its own set of tools, and part of the art is choice of tools. I’m not sure if this makes anything any clearer to anybody. Over the next week I’m going to be updating this site with some more examples. That should help.